One of my most favorite traditions of Christmas is decorating two trees in my home with vintage Shiny Brite ornaments. I jam-pack the trees full and the light they give off shines throughout the room and into the darkness outside the windows. I love the story behind the American company and how the war lent to its success. 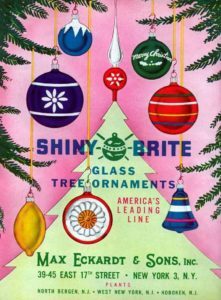 In 1937, Max Eckardt established Shiny Brite ornaments, working with the Corning Glass company to mass-produce machine-blown glass Christmas ornaments. 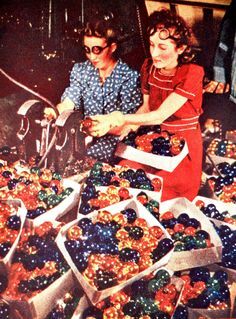 Eckardt had been importing hand-blown glass balls from Germany since 1907, but had the foresight to anticipate a disruption in his supply from the upcoming war. 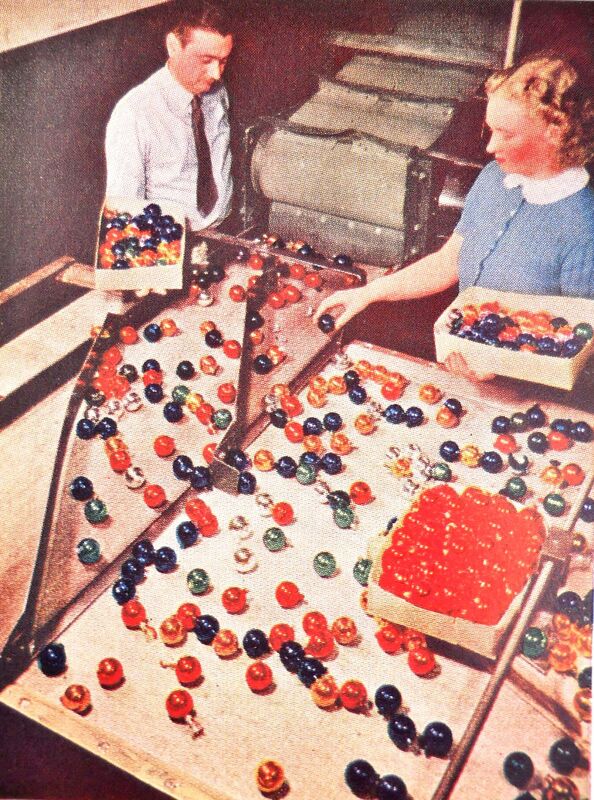 Corning adapted their process for making light bulbs to making clear glass ornaments, which were then shipped to Eckardt’s factories to be decorated by hand. 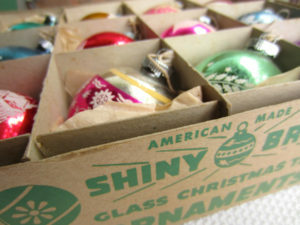 The fact that Shiny Brite ornaments were an American-made product was stressed as a selling point during World War II when Americans turned away from German-made products. Dating of the ornaments is often facilitated by studying the hook. 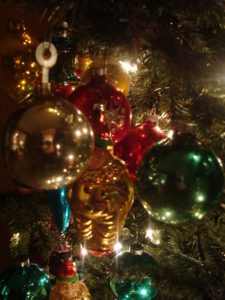 The first Shiny Brite ornaments had the traditional metal cap and loop, with the hook attached to the loop, from which the ornament was hung from the tree. 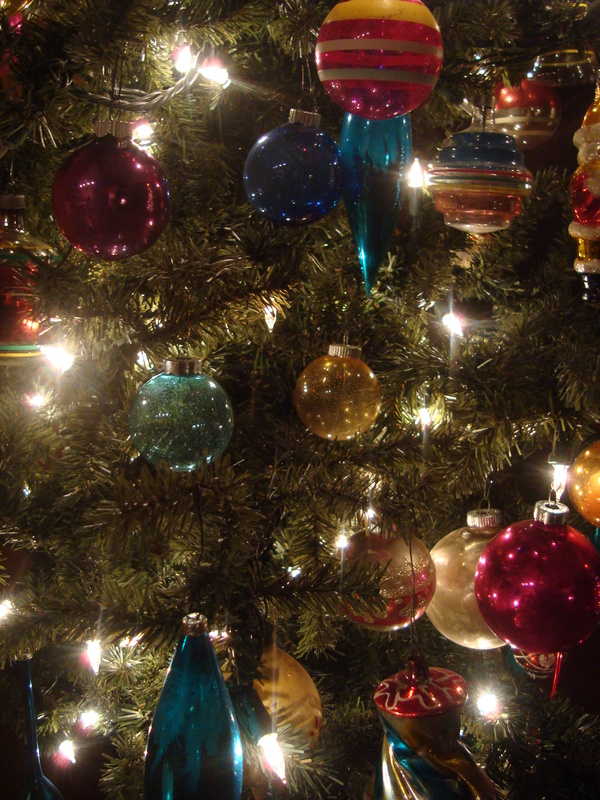 The first wartime ornaments were made from glass, but were not silvered on the inside. That made them appear very dull, so very quickly they were decorated with a sprig of tinsel on the inside to make them sparkle. As the war effort intensified, even this practice was abandoned because every piece of metal was needed and frivolous use of metal was not patriotic. 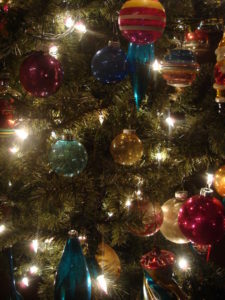 The metal caps were replaced with a cardboard tab, from which the owner would use yarn or string to hang the ornament. Eventually, the clear glass ball had only small stripes of paint for its decoration. Red was the favorite color during the 1940s, with silver and blue tying for second, and green coming in third. They were packaged in solid brown cardboard boxes, and later enhanced with a cellophane window and featured the words “American Made”. Following the war, Shiny Brite introduced a line of ornaments with a newly designed metal hook that provided the user with two lengths of hanger. The long hook traveled through the center of the ornament and exited the bottom, whereit attached to the foot of the ornament. This provided the “short” hanger. Unlatched from the bottom, the entire length of the hook was available, allowing the ornament to dangle at a greater distance from the tree limb to which it was attached. This arrangement was designed to allow the ornament to fill sparse areas of a natural tree. 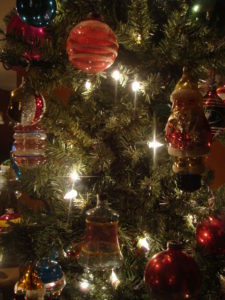 The increasing popularity of the aluminum artificial Christmas tree, first manufactured in 1958, made this hanger device far less attractive to the consumer, as an artificial tree had no gaps to be filled. The added expense of the lengthy hanging wire coupled with the diminishing need caused this feature to be discontinued in 1960. During its peak, Shiny Brite had four factories in New Jersey. The company’s main office and showroom were located at 45 East 17th Street in New York City. They stopped selling in the 1960’s, and weren’t made at all by the 1970’s. Shiny Brite’s most popular ornaments have been reissued under the same trademark by Christopher Radko since 2001, but to me there is no comparison for the original. I don’t always have the details of Christmas stories and memories when I come across a surviving box of Shiny Brites at estate sales, but I like to imagine the trees in the homes where they hung at the time from their cardboard tops. 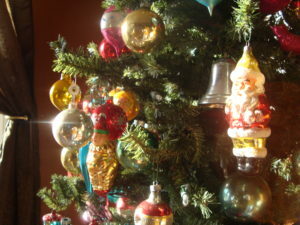 In a time of war, there was hope and a quiet time to hang ornaments on a tree and reflect on the meaning of the season. Get the War in your inbox! Copyright (c) The War In My Kitchen. All rights reserved.